The FieldMate family effectively supports the initial setup, daily maintenance, and troubleshooting for the maximum utilization of intelligent field instruments. FieldMate is a flag ship product of the FieldMate family which is a PC based full functional and full field protocol configuration tool. 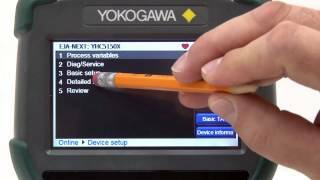 The YHC5150X FieldMate Handheld Communicator is the latest HART Communicator from Yokogawa. All HART field devices can be configured, polled, and trimmed utilizing a Windows Embedded CE™ based system for faster processing and greater storage capacity. All options are standard and no subscription is required. The YHC5150X is a full function, DD Direct, HART Communicator supporting universal, common practice, and device specific commands for commissioning, configuration, and maintenance operations. 11.9" x 5.6" x 1.9"
The YHC5150X has the ability to be upgraded from a remote location. This feature eliminates any down time and having to return the unit to the factory. The software allows the user to update the software/firmware, update all newly released DD Files, and update single DD files. Updating your software and DD files quarterly will enhance your product features and also allow you to communicate with newly produced products produced by Yokogawa or other manufactures. The FieldMate Handheld Communicator Data Converter for FieldMate ("Data Converter") is a data-interfacing software which allows device configuration files saved by the FieldMate Handheld Communicator to be used in FieldMate. Converts device configuration files created by the Handheld Communicator into DTM data that can be used in type-B HART Built-in DTM. Saves converted DTM data in the device maintenance information (DTM data) of FieldMate Advance. Saves converted DTM data to a DTM data file in a PC. The environment FCManager Ver 1.0 works. Launch setup.exe and install application. a. The FieldMate program must be closed to use the Data Converter. b. The handheld must be powered on for the data converter to communicate with the software. c. You must insure that the RDCS update has been completed for the driver to be loaded that allows the Data Converter to communicate with the Handheld communicator. After downloading the program, unzip the file and run the set.exe file. Follow the onscreen instructions to complete the installation. Please refer to the Instruction Manual or help file for using the data converter. Click here to learn more about FieldMate capabilities and funtions. 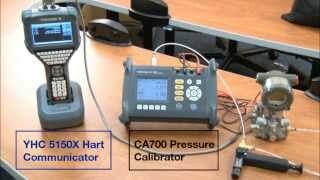 This video covers the analog sensor trim and calibration of a differential pressure transmitter using a Yokogawa YHC5150X FieldMate HandHeld HART Communicator.